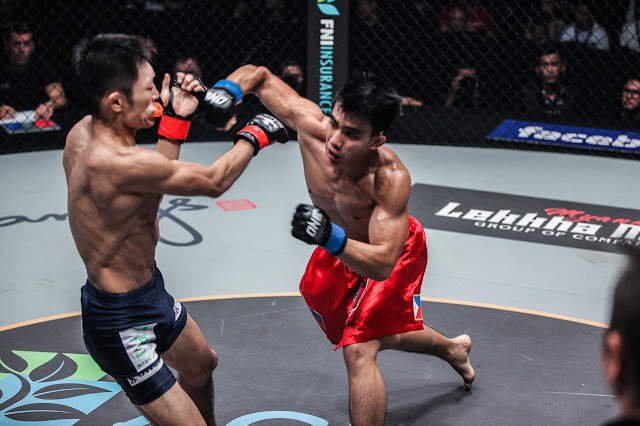 The 21-year-old native of Baguio City, Benguet competed on the undercard of ONE: HEROES OF THE WORLD, where he defeated gritty Thai grappler Kritsada Kongsrichai by way of first-round submission. Proving that Team Lakay fighters are not isolated in the striking department, Pacio effortlessly took Kongsrichai down to the mat and fastened a rear-naked choke to force his Thai foe to tap at the 4:37 mark of the first round. Pacio will be setting foot on Macao soil once again as he is set to compete on the undercard of ONE: KINGS & CONQUERORS, which takes place at the glamorous Cotai Arena of The Venetian Macao. Now using the moniker “The Passion” due to his ardent desire to improve each day as a martial artist, Pacio is slated to test his mettle with Japanese newcomer Hayato Suzuki. Pacio did not mince words about his excitement to strut his wares in Macao, which is also home to thousands of overseas Filipino workers. “I love fighting in Macao. The venue is so awesome. It’s truly world-class. Furthermore, there are a lot of Filipinos living and working there. Whenever I compete there, it feels like I am fighting back home. The energy is palpable. I can’t wait to be back,” he said. A member of the famed Team Lakay, Pacio is one of the most talented strawweights that has been ever produced by the flourishing mixed martial arts (MMA) scene in the Philippines. In addition, Pacio is a Wushu Sanshou specialist with a solid grappling repertoire. All but one of his career victories have come by spectacular finish, including five wins by submission and three wins by knockout. However, Pacio has a taller order in his new assignment as a ONE Championship athlete as he takes on Suzuki. Suzuki owns a remarkable MMA record of 16-0-2 and is known as a well-rounded warrior who has the ability to stop his foes with his heavy hands and technical grappling skills. Out of 16 career wins, Suzuki has finished 11 of his opponents, including six by submission and five by knockout. “It’s going to be an action-packed fight. I can’t be complacent. Moreover, I have to be two steps or three steps ahead of him,” Pacio said about his scheduled three-round strawweight clash against Suzuki. Pacio promises a new and improved version of himself when he steps inside the ONE Championship cage against Suzuki. “There is always a room for improvement. Although I won against Dejdamrong Sor Amnuaysirichoke last March, there is still an urgency to improve my skills and arsenal further after the fight. This time, we enhanced timing and precision. We added speed as well as proper executions of game plan,” he shared. With a tough foe in front of him at ONE: KINGS & CONQUERORS, Pacio is motivated to mark the first blemish in Suzuki’s immaculate MMA record. “He’s never been knocked out. He’s never been submitted. He’s undefeated. This is MMA. Anything can happen,” he conveyed. “My skills versus his skills will be incredible. This will be one of the fights that will be remembered because he will showcase his skills and I will showcase mine, so you had better watch it,” Pacio ended.